Micrograph (taken with a scanning electron microscope) of a pennate diatom frustule. Image courtesy Daniel Puppe. Silicon (Si) is the seventh most abundant element in the universe, and thus it can be found almost everywhere on Earth. That is why it is not surprising that numerous organisms are evolutionarily adapted to use monomeric silicic acid (H4SiO4) for the synthesis of hydrated amorphous silica (SiO2·nH2O) in a process called biosilicification. Well-known examples of amorphous silica structures are the shells of diatoms, the so-called frustules. 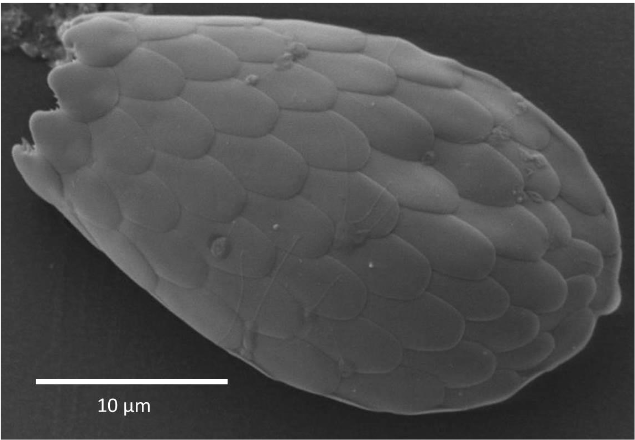 Another less known example is the shells of the unicellular testate amoebae. Numerous testate amoeba taxa synthesize single siliceous building blocks (the so-called idiosomes), which are used for shell construction. Micrograph (scanning electron microscope) of a testate amoeba shell (Euglypha spec.) build from single idiosomes. Image courtesy Daniel Puppe. According to their origin, synthesized biogenic silica (BSi) structures represent microbial (bacteria, fungi), phytogenic (plants), protistic (diatoms, testate amoebae), and zoogenic (sponges) BSi pools in soils. BSi pools have been identified to influence Si cycling and, thus, to impact carbon cycling as well, because both cycles are connected on a global scale. Fluxes of dissolved Si from terrestrial to aquatic ecosystems control the reproduction of marine diatoms (as they need Si for frustule synthesis), which in turn have an important effect on climate change due to their ability to fix large quantities of carbon dioxide via photosynthesis, since up to 54 % of the biomass in the oceans is represented by diatoms. Si fluxes are controlled by BSi pools to a great extent because BSi structures are far more soluble compared to silicate minerals, i.e., the non-biogenic Si source in soils. 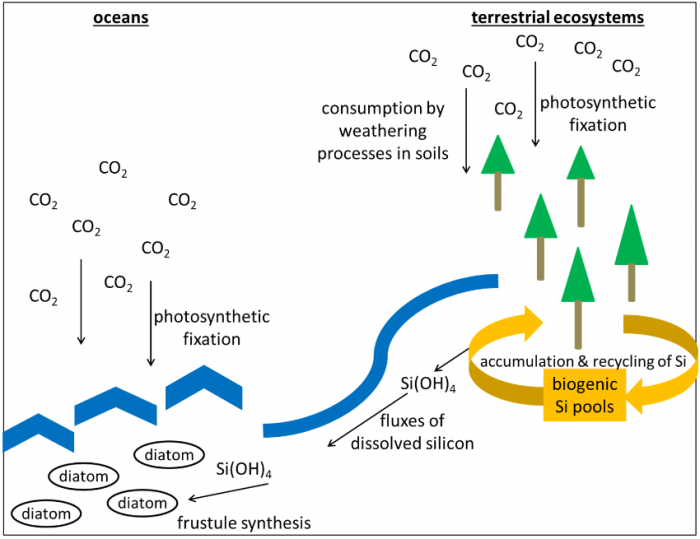 Schematic overview of global Si cycling and its linkage to the carbon cycle. Image courtesy Daniel Puppe. is leached as a function of rainfall and irrigation, especially in agricultural soils. In addition, the content of phosphates influences Si availability because phosphates and H4SiO4 compete for equivalent adsorption sites in soils. Due to intensified land use (forestry, agriculture), humans directly influence Si cycling on a global scale. In this context, especially Si exports by harvested crops (most of them are Si accumulators) and increased erosion rates generally lead to a Si loss in agricultural soils (= anthropogenic desilication). Besides climate change, a growing global population and decreasing resources anthropogenic desilication is one of the big challenges for modern agriculture. Harvesting of field crops, for example, causes a Si loss of up to 100 kg Si ha-1 per year. On a global scale, about 35% of total phytogenic BSi is synthesized by field crops due to their relatively high Si contents as well as biomasses and this proportion is going to increase with increased agricultural production within the next decades. For a deeper understanding of how BSi pools control Si fluxes and plant-available Si fractions in soils, information on BSi dissolution kinetics is crucial, which are affected by the physicochemical surface properties of BSi structures like phytoliths, diatom frustules or testate amoeba shells. In our work my colleague Martin and I used confocal laser scanning microscopy (CLSM), Fourier transform infrared (FTIR) as well as diffuse reflectance infrared Fourier transform (DRIFT) spectroscopy to analyze physicochemical surface properties of biogenic silica structures. For analyses of these microscopic structures, we used a DRIFT spectrometer coupled with a microscope (a so-called DRIFT microscope), which allowed us to apply infrared spectroscopy even on a µm-scale. The advantages of both CLSM and DRIFT microscopy are that (i) measurements can be applied directly at intact samples and (ii) the same samples can be used for further analyses after examinations because both methods are non-destructive (which is in contrast to FTIR spectroscopy, where samples are finely ground). In our study, we aimed to assess the suitability of spectroscopic (transmission FTIR, DRIFT microscopy) and microscopic (CLSM) techniques for the detection of (i) short-term changes in physicochemical surface properties of fresh (extracted directly from plants) and aged (extracted from soils) phytoliths and (ii) differences in physicochemical surface properties of diatom frustules, testate amoeba shells, and phytoliths. We hypothesized (i) physicochemical surface properties to be dependent on BSi origin (BSi synthesized by plants or unicellular organisms) and (ii) age-related differences in physicochemical surface properties to occur relatively fast (already after some years). To test our hypotheses, we took soil and plant samples in an artificial catchment (called ‘Chicken Creek’), that was man-made in 2005 and has been left to an unrestricted and unmanaged succession for investigations of ecosystem development from the very beginning. The study site Chicken Creek allowed us to analyze relatively young (about 10 years) soil and plant samples by a combination of transmission FTIR, DRIFT microscopy, and CLSM. Our results on hand showed that spectroscopic and microscopic techniques, in general, are well suited for the detection of (i) short-term changes of physicochemical surface properties of phytoliths (fresh phytoliths differed from aged phytoliths) and (ii) differences between BSi synthesized by unicellular organisms (i.e., testate amoebae and diatoms) and plants. We found DRIFT microscopy and CLSM to represent promising alternatives to transmission FTIR because these methods enable analyses of selected single BSi structures like single phytoliths, testate amoeba shells, or diatom frustules allowing a detailed assessment of BSi quality (i.e., age and origin of BSi) in soils. A combination of BSi qualification and BSi pool quantification in different undisturbed and disturbed terrestrial biogeosystems will allow us to better understand the role of BSi pools for Si cycling in general and the impact of humans on it (anthropogenic desilication) in particular. These findings are described in the article entitled Physicochemical surface properties of different biogenic silicon structures: Results from spectroscopic and microscopic analyses of protistic and phytogenic silica, recently published in the journal Geoderma. Daniel is a biologist at the Leibniz Centre for Agricultural Landscape Research (ZALF). His field of expertise is soil chemistry.